Welcome to SCUBA News - thanks for subscribing. My apologies if you didn't get the last issue. Some servers took a dislike to the newsletter and bounced it back to us. We've now been publishing SCUBA News for 15 years. It has always been, and will continue to be, free. But this means that we can't pay any of our writers or photographers. However, if you want to reward the contributors you can now do so at Patreon (https://www.patreon.com/SCUBANews). We'll share the contents of the tip jar between this month's writers, photographers and the Marine Conservation Society charity. If you would like to contribute an article to SCUBA News - e-mail news@scubatravel.co.uk. 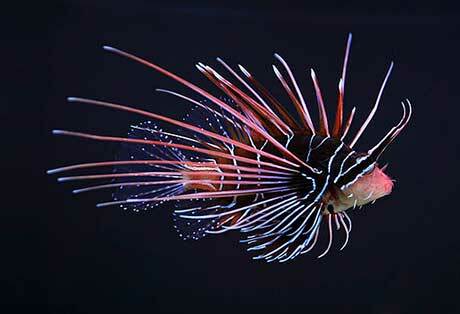 Our guest article today is by Steven Rogers, who's creature of the month is the lionfish. Thanks Steven. Diving the Maldives is a dream of many divers - and no wonder. Not only is the diving world class but the Maldives government is working towards making the entire archipelago a marine reserve by 2017. This year's Going the Extra Mile Scuba Challenge is on Saturday 5th September in the UK - to join us call 07879 440 134 or tweet @davet21. Lionfish, genus Pterois, is very popular amongst those with aquariums, and this trade may have led to them being described as amongst some of the most aggressively invasive species on the planet. Lionfish are native to the Red Sea, Pacific Ocean, and Indian Ocean, most often found around corals, reefs and rocky surfaces down to about 50 m. They have quite a distinctive appearance with their red and white stripes, together with large spiky dorsal fin rays containing venom for defence against predators. They don't appear to have many natural predators, but large Groupers and Moray eels have been observed feeding on them. 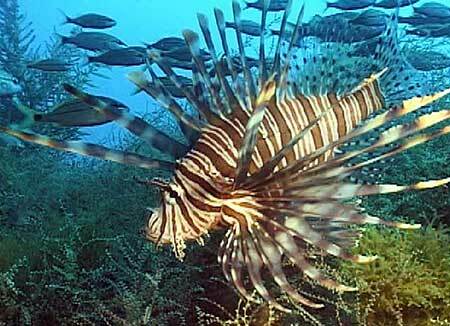 Lionfish can live 15 years and reach 45cm (17.7in) in length. They have several adaptations, the most dangerous being the venom contained in the dorsal fin rays that can be hazardous to divers. This venom can cause nausea, dizziness, breathing difficulties, and in some rare cases, limb paralysis and death but are only harmful if you come into contact with it. Juveniles also show a unique adaptation, they possess a tentacle above their eye sockets that is thought might be used to either attract prey or in sexual selection. For food Lionfish tend to prey on almost anything they can find, small fish, invertebrates, molluscs and the larger ones may even prey on juvenile lionfish. Some have been found with up to 6 different species of prey in their stomachs. In hunting prey, it is believed they shoot out jets of water to disorientate or stun their meals. Outside aquarium circles, Lionfish are perhaps most famous for the speed in which they have invaded the east coast of the Americas, stretching from the Delaware Bay down to Brazilian waters and everywhere in between. It is thought, due to their resemblance to the species found in the Philippians, Lionfish where likely introduced into the Atlantic waters from private owners who found they could no longer look after their pets when they became too big. They don't like to play nice with other fish either. They quite often show a hostile attitude towards others and are fiercely territorial, much to the detriment of other reef fish. This hostile attitude along with no natural predators does not bode well for the Atlantic reefs, where studies in the Bahamas have shown that Lionfish could be responsible for a decrease of up to 80% of reef diversity. To control the invasive populations of P. Volitans and P. Miles, several avenues have been explored. 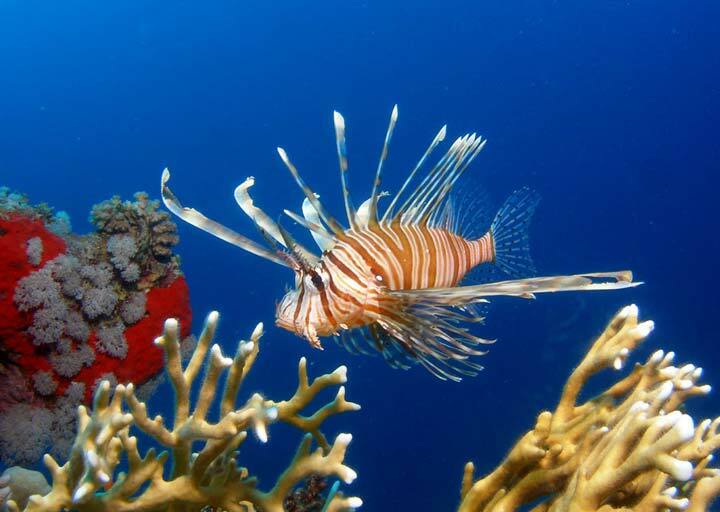 Spearing of the Lionfish has been legalised in some countries with a few even organising 'derbies' to control numbers. One other novel approach is to try and promote their meat for human consumption, which can apparently be quite tasty if you're brave enough to try! Steven Rogers is a 3rd year student of Marine Biology at the University of Aberdeen. He can be found discussing science and football on Google+, Tumblr at marinebiolove, and Twitter at @CabinBoy365. Check out his blog marinebiologyblog.com. SCUBA diving is one of the the fastest growing tourism sectors. The increasing numbers mean many more people are aware of the beauty and importance of the marine environment, but also puts a great strain on the coral. Not only is it damaged by inexperienced divers kicking it and pollution from boats and hotels, research also shows that coral is much more likely to become diseased in highly dived areas. Diving almost continuously at great depth during most of the year, and covering large distance through remote areas of the Southern Ocean, Kerguelen elephant seals have proved to be a releviable alternative to other instruments for monitoring the oceans. The seal-derived measurements of oceanic dissolved oxygen give better results than possible using any other method. A pygmy blue whale has migrated at least 5200 km, the longest recorded latitudinal migration made by any Southern Hemisphere blue whale on record. A shortfin mako shark, dubbed Jiffy Lube2 by researchers, beats Isabela's journey as it was tracked for 17,700 kilometres in the past year, looping the Atlantic twice. Europe is woefully behind in its ambition of achieving a 'good environmental status' of our seas by 2020, according to a reportby the European Environment Agency. Only 4% of the marine species and habitats assessed have achieved the 2020 target of 'good' status. A commercial diver has admitted a 46,000 pound fraud after removing three cannon from a 17th Century shipwreck. The South Australian government will use explosives to scare fur seals away from fishing areas, after rejecting a call to start killing the animals. THE Scottish Government has lost a long-running battle to keep secret the names of fish farms that shoot seals. Manufacturers Technosport are recalling about 2600 scuba diving masks as the glass in them can shatter during normal use.The 2600 faulty masks were made in China, sold in America and on Amazon, and are the Omersub Zero Cub brand. Swimmers and surfers today are about 90 per cent less likely to be attacked by sharks off California's coast than they were in the 1950s, even though there are hundreds of thousands more people in the water, according to a new study. Rising sea levels could decimate sea turtle nesting sites around the world, scientists have warned, with the largest rookery site for green turtles increasingly at risk from being swamped by seawater. Red algae are the great "also-ran" of plant evolution. Though they are by far the most diverse seaweeds in the ocean, they rarely occur in freshwater and never on land, and so almost no one has ever heard of them (though if you've ever eaten sushi, you've certainly had an intimate red algal encounter). The 'top heavy' European Common Fisheries Policy (CFP) hasbeen largely ineffectual for most of its life, according to the UK National Federation of Fishermen's Organisations.